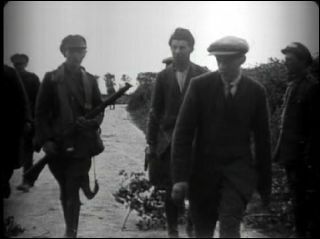 The Irish Civil War broke out in late June 1922. What might have been a brief coming to blows between rival IRA factions instead dragged on for many months, in a small-scale but brutal guerrilla and counter-insurgency campaign between the new Free State government and the Anti-Treaty IRA. As 1922 turned into 1923, it was becoming clear that the guerrillas were not going to topple the Free State, which took increasingly draconian measures –such as wholesale internment and selected executions of captured Anti-Treaty fighters. Towards the end of February 1923, the Executive of the Anti-Treaty IRA met in an isolated location named Ballingeary in Tipperary. IRA chief of staff Liam Lynch was told that the guerrilla army was on the brink of collapse. Their 1st Southern Division reported that, “in a short time we would not have a man left owing to the great number of arrests and casualties”. The Cork units reported they had suffered 29 killed and an unknown number captured in recent actions and, “if five men are arrested in each area, we are finished” . Lynch chose to continue the war. The Free State had suspended executions in early February, in the hope that it would help to speed the end of the conflict and the meeting of the IRA leadership must have seemed like the ideal opportunity for them to call it off. For whatever reason, bloody mindedness, fanaticism and idealism are among those attributed to him, Lynch refused. The following month, known among Kerry Republicans as the “terror month” – March 1923 – would demonstrate the cost in lives and bitterness of such a policy. Kerry had seen more violence in the guerrilla phase of the war than almost anywhere else in Ireland. The local IRA had been almost entirely Anti-Treaty, and after the National Army’s seabourne landings in August of the previous year, had resisted tenaciously. Kerry was occupied by sometimes brutal National Army troops of the Dublin Guard, a former IRA unit, turned into a regular Army formation but still officered largely by ex-Squad men. By March 1923, 68 Free State soldiers had already been killed there and 157 wounded – a total of 85 would die there by the end of the war . From the start the fighting there had been less than chivalrous, on either side. The Anti-Treaty fighters had targeted medical orderlies and assassinated two local Free State officers – the Scarteen O’Connor brothers – in their beds. The Dublin Guard for their part beat, tortured and sometimes shot prisoners. March 1923 would be the nadir of the Civil War in the county. 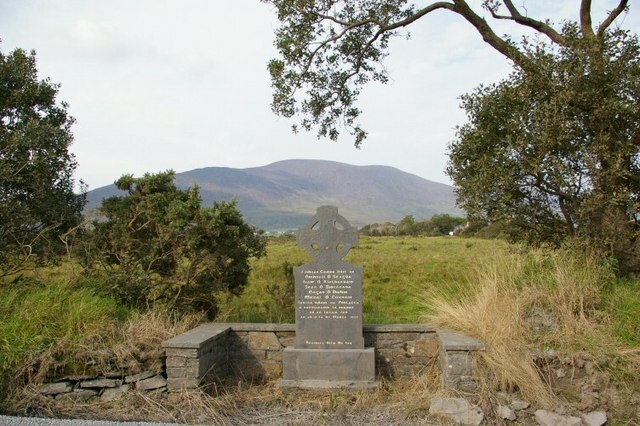 The month started in Kerry with an Anti-Treaty attack on Cahirciveen. The Republicans were surprised before they could actually assault the town and dispersed, amid running fights, into the hills to get away. Three National Army and two Republican soldiers were killed and six IRA men captured. A typical, if comparatively bloody, Civil War skirmish. The following day, acting on information from an informer, a party of National Army officers drove out of Tralee to a village named Knocknagoshel, where they expected to find a Republican dugout. As they entered the dugout, they triggered a booby-trap mine which blasted the party and killed three Dublin Guard officers and two soldiers. Two of the dead were close personal friends and ex-IRA comrades of Paddy Daly, in command of the Free State’s Kerry forces. He announced that in future prisoners would clear mined roads. The day after the Knocknagoshel bomb, nine prisoners from Kerry number one Brigade were taken from Ballymullen gaol in Tralee to Ballyseedy crossroads, ostensibly for this purpose. The troops made sure that they were, “all fairly anonymous, no priests or nuns in the family, those that’ll make the least noise”. Some of the prisoners had already been beaten by the time they arrived at Ballyseedy, where they were tied around a landmine and literally blown to smithereens. One man, Stephen Fuller, was not killed but blown clear by the blast and lived to tell about the massacre. At the scene, the Free State troops shovelled the remains of the pulverised bodies into nine coffins and drove them back to Tralee with the story that they had been accidentally killed while clearing a mined road. 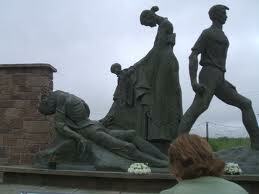 A riot broke out in the town when the relatives of the dead tried to break open the coffins and identify the dead . Paddy Daly – the man behind the killings at Ballyseedy, Countess Bridge and Caherciveen. If anyone believed that the explosion at Ballyseedy had been an accident, they would have trouble explaining the deaths of nine more Republican prisoners in the next four days. In fact, the killings seem to have been highly premeditated, a coterie of Dublin Guard officers choosing sample prisoners in turn from each of the Kerry IRA units for ‘exemplary’ execution. Four members from Kerry number two Brigade were blown to pieces in Killarney, also on March 7. One man, Tadgh Coffey, was, like Fuller at Ballyseedy, blown clear and survived. Five days later, on March 12, another five men, this time from Kerry number three were blown up at Cahirciveen, this time, to avoid any more escapees, having been first shot in the legs..
Before the month was out, two more prisoners were killed in Kerry, simply shot out of hand – bringing the number of prisoners killed in reprisal for Knocknagoshel up to 19. Two prisoners were also officially executed in Tralee in April. .
Perhaps the most sinister aspect of the incidents was the Government response –which showed the extent to which they looked the other way at atrocities committed by their troops throughout the war. Richard Mulcahy defended Paddy Daly’s story of accidental deaths in the Dail and an Army inquiry cleared the soldiers concerned. We now know, following the release of documents kept secret until December 2008, that not only did the government know that the prisoners had been murdered, they even knew who did it, a group of Dublin-based troops known as, “the Visiting Committee” in National Army circles . In revenge for Knocknagoshel, 17 prisoners were killed in Kerry within four days and another seven before the month was out. Before March was over, there were two more long-remembered incidents of vicious revenge killings. In Wexford, which had been free of executions up this point, three Republican prisoners were shot on March 13. 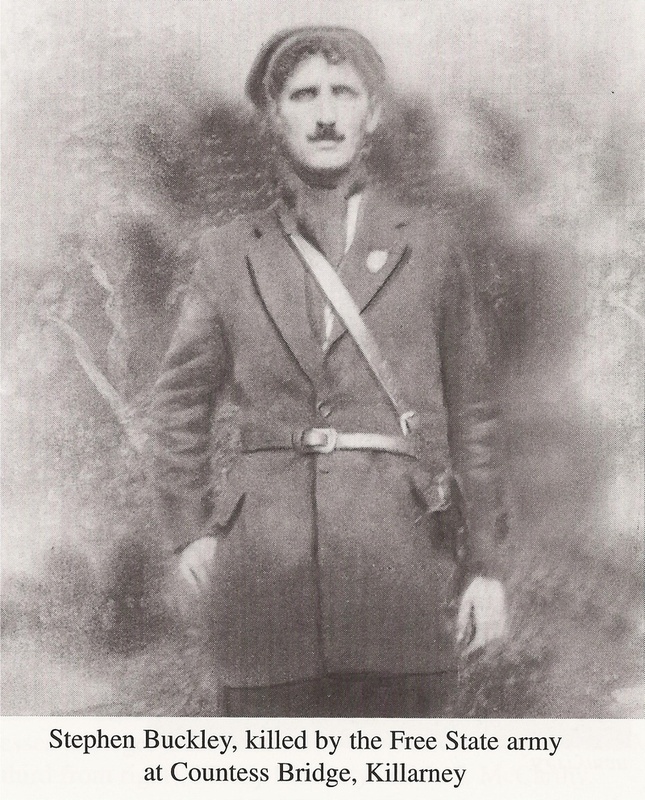 Bob Lambert, the Wexford IRA commander had three National Army soldiers captured and killed in retaliation . The local Free State forces retaliated by assassinating at least two more local republicans. In Donegal, National Army troops responded to the death of a soldier in an ambush by executing four prisoners who had been held in Drumboe castle since January. The IRA and the underground Republican “government” proclaimed a period of national mourning for their dead and banned public entertainments and sporting events. An international boxing match in Dublin on March 17 had to be guarded by a battalion of Free State troops and the crowd attending it was attacked with a mine and gunfire. To this dreary catalogue of atrocity could be added dozens of other forgotten incidents from the same month – a lone National Army sentry killed by a sniper in Tralee, four Anti-Treatyites gunned down by machine guns after a failed ambush in Wexford, two assassinations of suspected republicans in Dublin by Free State Intelligence, two off-duty Free State soldiers seized and shot in the same city; and so on. Such was the fruit of civil war. . If the savagery of March 1923 was not reason enough for calling a halt to the war, then the Republicans had also the compelling reason of the collapse of their military effort. And yet, at first, they didn’t. In a meeting in the Knockmealdown mountains on March 26, their Executive voted to continue the war by 6 votes to 5. Eamon de Valera, by now urging the military leadership to end the fighting, was allowed to listen to their debate but not given a vote . 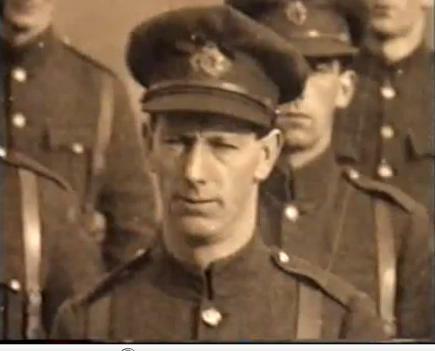 Liam Lynch the Republican Chief of Staff and the man who had done so much to prolong the conflict, was killed on April the 10th, while fleeing from Free State troops in the Knockmealdown mountains. Frank Aiken who took over as IRA chief of Staff, called a ceasefire on April 30th. On May 24th, he ordered the remaining guerrillas in the field to “dump arms”. This was not the same as a surrender – the Civil War never formally finished – but it was effectively the end. The bitterness of the Civil War’s final few months would live long in the memory of participants. The casualties were considerably higher in the conventional fighting of July and August 1922, but it was the manner of the deaths in March 1923 that was so hard to forgive. The fallen killed not in combat but coldly murdered when helpless and unarmed. The men on the ground, on both sides, were in the final stage of years of exposure to and practice of violence since 1919. Looked at in this light, the atrocities of the Civil War on both sides can largely be explained by a grim cycle of retaliation – the need to hit back for hurt caused to one’s own comrades. Many of these men, especially those in the Dublin Guard, had been inured to killing by years of casual and up-close acquaintance. March 1923 demonstrated the depths of cruelty they had reached. The Irish revolution, born out of violence, but also with great hopes, in 1916, died a miserable death in the back-roads of Kerry in the spring of 1923, like so many revolutions, consuming its own sons. Listen to an interview with John Dorney on the events of March 1923 here. 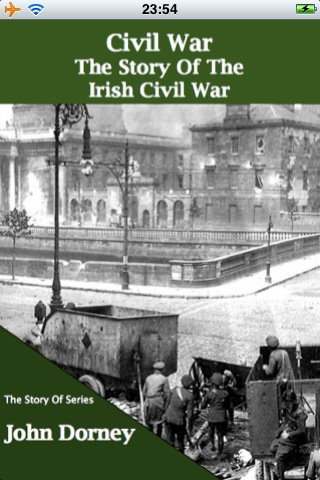 The Story of the Irish Civil War is available here. According to Niall Harrington, cited in RTE Documentary, The Ballyseedy Massacre, 1997. Written by: John_Dorney on 14 March, 2011.on 11 April, 2017. 32 Responses to "March 1923 – The Terror Month"
March 24th 1923 in a case of mistaken identity at Baranig wood for the booby trap mine which resulted in the Ballyseedy repisal should have been mentioned by name as he like others died in vain for his Country and should never be forgotten. his brother Patrick also a blacksmith, was my paternal grandfather. My great grandmother, Mary, married John Murphy from Knocknagashel, Co. Kerry in 1904. John’s nephews were Daniel Murphy, the blacksmith volunteer, and ‘Coffey’ Murphy who was also a blacksmith. I do. to know the name of other siblings. My grandfather was born in 1894 before John and Mary married. My grandfather’s father is listed as John Curtin. My grandad was born in the Workhouse, Gortboy, Co. Limerick. I visit Murphy relations in Knocknagashel. The relations are Donie and Kathleen Walshe. They live in Coffey’s house, next to the ruin of the Forge. Hello Eileen Thank you for your response. I know very little about the knocknagoshel side of the family but was told that my grandfathers brother Daniel Murphy was shot in woods nr their home on 7th March 1923, after a booby trap on 6th March 1923, and My grandfather Patrick fled to Liverpool as he was in danger, and his first son was my father who was also named Daniel Murphy, my grandfather married Margaret Mary McHugh, having four children Daniel, Edward, Kathleen and William,. Thanks Eileen, i believe my grandfathers mother was the sister of Dan Murphy’s father. My own dad Tighe Tim Doody now 87 used to relate the tale to me when i was a child and he used to be able to sing a verse or two of the song, The blacksmith volunteer. Right you are Michael, I’ve fixed that up. A very interesting story and well written. I was just wondering if my great uncle had any part in this story or if you know of him his name was paddy King , from Dublin , I know he was a messenger boy for De Valera and was in the 3rd battalion and that’s about it ! Hi Ronnie, I had a quick look through the Bureau of Military History and the Military Pensions files. I’m seeing a Patrick Kingfrom Galway but not from Dublin. Not the same man I don’t think? There also seems to be a P.King who was a Major in the National Army in the Civil War. Could that be him? That would have put him in Dublin I think so he probably wouldn’t have been mixed up in Ballyseedy. But I’d have to dig deeper to be sure. Hi Donie, thanks for getting touch. We can track down people much more easily now thanks to the Irish Military Archives online resources. His pension file is here. http://mspcsearch.militaryarchives.ie/detail.aspx?parentpriref= Click on the PDFs there to get more details. I am researching my ancestors from Kerry and have been sent some information about Michael O’Connell who was one of the 9 killed during the Ballyseedy Massacre. Michael O’Connell would be my 1st cousin 3 times removed…one of the others killed was a John Daly. I am wondering if John Daly was a cousin of Michael O’Connell/ Also if there is any photos of both of these men.